Ideal for wet/dry grinding and chutney grinding, the Philips HL7720 Mixer Grinder makes cooking an easy task. The sleek Philips HL7720 features 3 stainless steel jars with quality blades for fine grinding. It comes with the click lock jar assembly for secure and easy locking of the jars, and a 3 speed 1 pulse configuration for speed adjustment. The advanced ventilation system increases the motor life. The Philips mixer grinder features a 0.4 litre chutney jar, a 1 litre dry jar and a 1.5 litre wet jar to suit your various mixing and grinding needs. For optimal functioning, this mixer grinder from Philips consumes 750 watts of power. The automatic shut-off feature protects the mixer grinder from overload dangers. 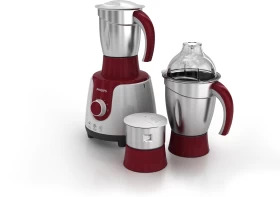 3 Speed 1 Pulse Configuration, Overload Protector, Quality Blades Fine Grinding, Wet Jar: 1.5 L with SAN Dome and Handle, Dry Jar: 1 L with PP Lid and Handle, Chutney Jar with PP Lid, Open Coupler for Easy Cleaning and Maintenance, Click Jar Assembly for Secure and Easy.